When you get the call to take your music 5000 miles from home, the chances of making an impact are pretty high with respect to the quality of your wares. Jenny Ritter got such a call to make the trip from Vancouver to Britain and impressed sufficiently to get a repeat two years on. The link between the two visits has been an invite to play at the prestigious Celtic Connections Festival in Glasgow and share the stage with many other like minded roots musicians. Of course it’s also useful to tag a few extra dates onto the schedule to play more shows and in 2016 it was the turn of Birmingham’s Kitchen Garden Café to host Jenny and her band. Since that inaugural visit, Jenny has released her second solo album, so a few of us knew what to expect albeit this was the first time seeing her live. The venue Jenny elected to play on the trek south from having the honour of supporting Lucinda Williams north of the border was well used to hosting folk and roots acts from North America, with most having fond memories of playing the intimate brickwork surroundings. At the end of the show, Jenny joined the long list of fellow Canadians to play the Kitchen and her performance matched up well to fellow compatriots such as Po Girl, Sarah MacDougall, Cara Luft and Amelia Curran to name a few. She also had the added benefit of being backed by a three piece band which did an excellent job of helping Jenny present mainly original songs, with the obligatory Neil Young cover to close the show. Jenny’s brand of folk music has a bright and breezy persona with an inner strength. Like many fellow songwriters, the inspirations are mainly observational and situational, all expertly delivered by a well formed compact band. 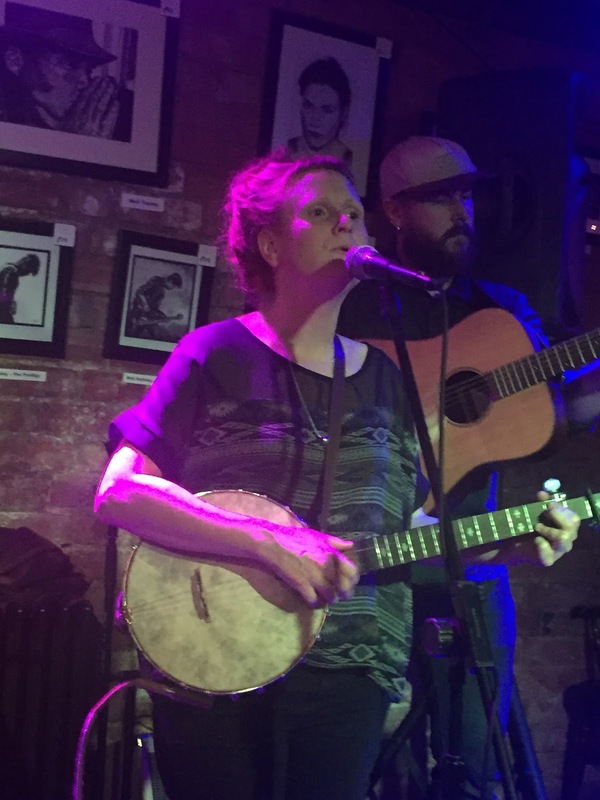 Jenny herself fluctuates between playing guitar and banjo, with the latter possessing a magical sound. She acknowledged the main player as Adam Iredale-Grey who majored predominately on fiddle with the occasional switch to acoustic guitar. He is also heavily involved in the producing of Jenny’s music. The other permanent band member was Ryan Boeur, who succeeded in optimising the sound of electric guitar in a venue which requires precision electrification. The touring quartet was completed by Nat Sabat on stand-up bass who had the dual distinction of being both a newbie and sole American alongside three Canadians. Together they more than held their own and allowed a pair of forty-five minute sets to flourish impressively. Most of the songs were from the recent album RAISED BY WOLVES with a couple taken off the 2012 release BRIGHT MAINLAND. One from each record opened the first set in the guise of the elder ‘They Can’t Tell’ and the more recent ‘A History of Happiness’. These were equally among the highlights of this part of the show with perhaps both just being eclipsed by a new song which was introduced prior to the break. Inspired by the sickle moon, Jenny hinted that it may eventually take the title of the main chorus line namely ‘Baby Moon’, but either way it sounded great and signalled a positive future. With increased informative chat on offer after the interval, we learnt a little more about the songs such as the finding Vancouver theme to ‘Five Nights’, the struggles of commissioned song writing in ‘Museum Song’ and the need to live in the moment as expressed in ‘Remember the Life’. The second half saw Jenny and the guys excel on the strongest song from the RAISED BY WOLVES album ‘Wolfe Wife’ and encourage the audience to exercise their vocal chords a little with the chorus friendly ‘We Must Sing’. Little invitation was also needed to join in the encore choice of ‘Heart of Gold’ which had a superb roots-style arrangement to flavour what is a conventional standard. All these songs were beautifully sung by Jenny, while shaking off those ailments which so often afflict touring musicians at this time of the year. Jenny had a few more dates to fulfil before heading back to Canada and certainly more fans will be accumulated before boarding the plane home. While the venues and experiences on this post Celtic Connections part of the tour may well not match the prestige of opening for Lucinda Williams, Jenny knows where her bread and butter is as well as its long term value. Jenny Ritter may not be a name you know too well, but rest assured she will continue to develop as an artist and have further opportunities to play her fine music 5000 miles from home. Jenny Ritter - Wolf Wife (Official Video) from Jenny Ritter on Vimeo.